If you’re like me, you’ve already started a short list of home improvement projects to invest in with your 2015 tax return. Below is a list of five home improvement projects that you should prioritize because tax incentives are currently set to expire at the end of 2016. These projects will bring you short and long-term savings by increasing your energy efficiency as well as savings in the form of tax credits. A new ‘Cool Roof’: By selecting a light colored roof material (metal or asphalt), you’re decreasing the amount of heat that’s absorbed by your home. You can also claim a tax credit that’s10% of the material cost up to $500. Replacing doors, windows or skylights: ENERGY STAR qualified materials will bring you savings in heating, cooling and lighting as well as a 10% tax credit up to $500 ($300 for windows). Going Tankless: Heating water can account for 14-25% of your homes energy use. Investing in an energy efficient model will give you energy savings and a tax credit for up to $300 of the units cost. Insulation: By increasing the insulation in your walls or attic, you will decrease your home heating and cooling costs as well as receive a 10% tax credit for the cost of the product, up to $500. For all of these upgrades, you should be able to verify their qualification with your contractor or sales person. For more information on energy efficient tax credits and incentives visit: Federal Tax Credits for Consumer Energy Efficiency or Energy Efficiency Tax Credits, Rebates and Financing: What Options Are Available for You? The Detroit Zoological Society’s Center for Zoo Animal Welfare acts as a resource for knowledge about animal welfare, and in many cases, this includes providing training to others in various ways. One such way is through our residency program. Residencies offer individuals the opportunity to better understand animal welfare and how to apply scientific principles in order to assess it. 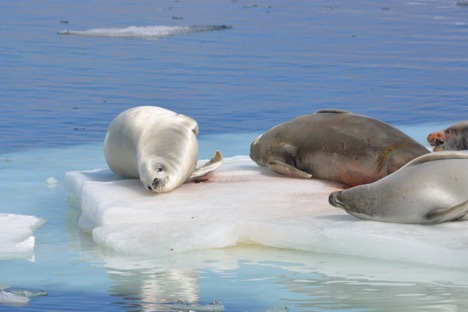 Residents are recent college graduates who join our team for a period of six months, during which they assist with data collection on various welfare-related research initiatives and conduct their own independent project designed to provide us with more information about how animals are doing. 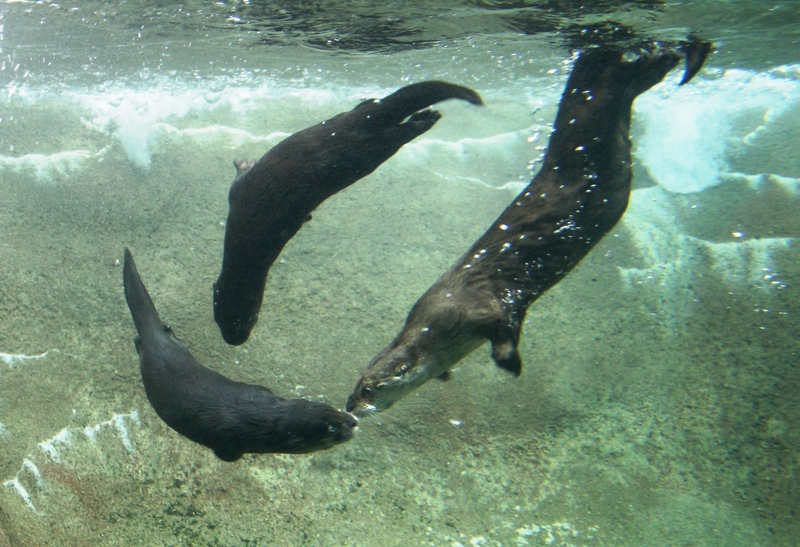 Past residents have examined such concepts as the impact of underwater complexity on North American river otters, how temperature and social relationships affect how Japanese macaques use their habitat, and the effect of varying how food is presented on the behavior of the king brown snake. We currently have two brand-new residents working with us, and we are so excited to have them join the team. They will be helping to collect data on the penguin welfare project we are currently working on as we prepare for the opening of the Polk Penguin Conservation Center; using video recordings of what the aardvarks are doing at night so we can have a better idea of how they spend their time and what environmental features they might prefer, and focusing on assessing the welfare of one of the species at the Zoo as part of an independent project. The information they gather will help us to figure out if the animals are thriving, and if any changes could result in even better welfare. We are glad to be able to provide these kinds of educational opportunities to aspiring animal welfare professionals. Not only does this enable us to undertake even more welfare-related projects here at the Detroit Zoo, which helps to expand the existing body of knowledge about animal welfare, but it also promotes the advancement of animal welfare as these residents go on to the next part of their career. A big thank you to all who participated in our humane education craft during Wild Lights at the Detroit Zoo! 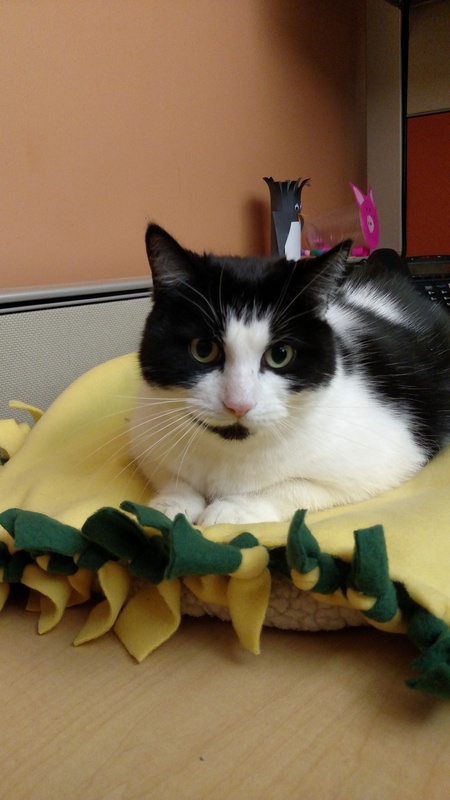 We offered an opportunity for guests to make a fleece blanket or kitty play toy that would, in turn, be donated to local shelters. I’m happy to report that many homeless dogs and cats are currently benefitting from your generosity. I recently dropped off eight large bags to the Humane Society of Huron Valley and many more will also be donated to the Michigan Humane Society in the coming weeks. 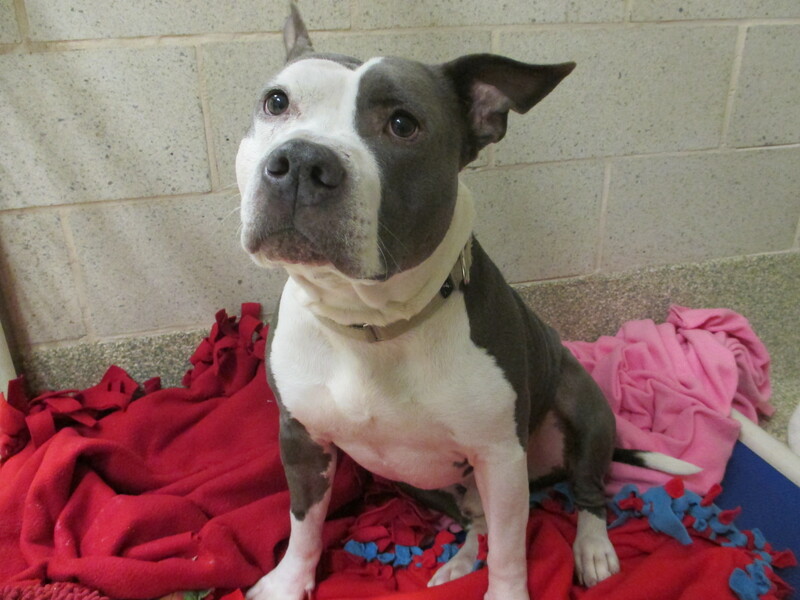 Once the animals are adopted, their new guardians will be able to bring the blankets and toys home with them. This allows the companion animals to have something familiar in their new surroundings and can help with the transition into their forever families. Our craft projects are purposefully designed. They are often centered around being kind to animals and the planet – not only does this instill a sense of joy, but there’s research that shows when you’re kind to others, it helps to foster empathy within. Simple acts of kindness can make a big difference! Want to get started right now? You can find additional ideas on how to help animals at www.detroitzoo.org, www.hshv.org and www.michiganhumane.org. Happy New Year from 64°46’27” S, 64°03’15” W! 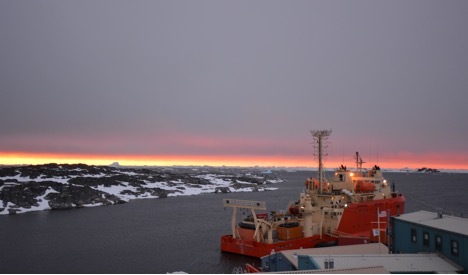 In Antarctica this time of year, the nights are very short – the sun sets around midnight and rises at 2 a.m., so it never really gets dark. 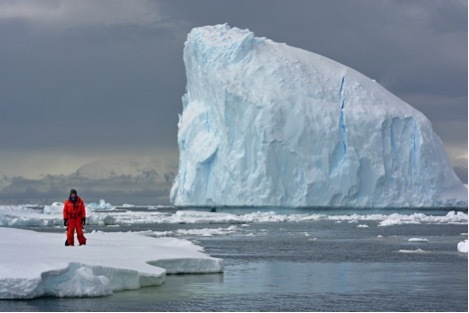 As the days pass, many icebergs drift by and their variation and beauty leave me in awe. From small to huge, they come in any shape you could imagine and they express a variety of whites and blues. 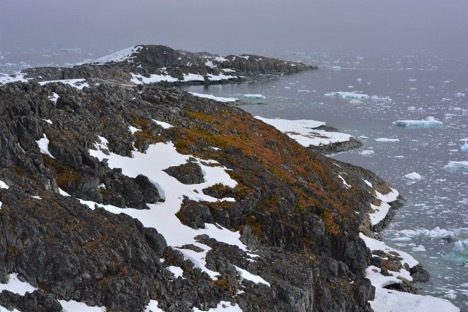 It is snowing a bit less, and the islands are starting to melt down a bit, which exposes the rocky cliffs and reveal a variety of different lifeforms. Antarctic hair grass is one of only two species of flowering plant found in Antarctica, and mosses and lichens paint the rocks on the islands in greens, yellows, oranges and more. Lichens are organisms made up of a symbiotic (or mutually beneficial) relationship of a fungus paired with algae and/or cyanobacteria. 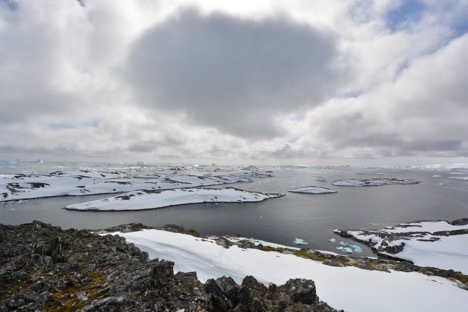 This nice break in the weather allowed us to make our way further south to conduct a survey of gentoo penguins. This species of penguin is the third largest in the world and there are currently around 300,000 breeding pairs worldwide. Where we are right now is on the southern extent of their range. It’s exciting to see this particular species in the wild, as gentoos are one of the four species of penguins at the Detroit Zoo. 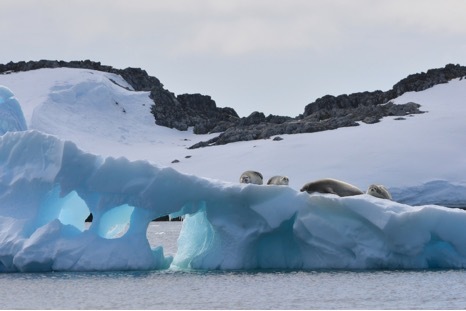 And while I’ve been in Antarctica, 20 additional gentoo penguins arrived at the Zoo as we prepare for the opening of the Polk Penguin Conservation Center in April. 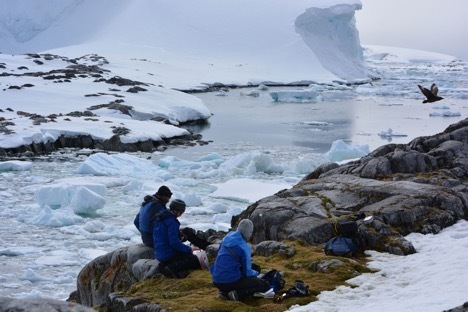 Our team split up into groups and together we achieved a full survey of gentoo nests on the island. Most of the birds are incubating two eggs each in nests formed out of rocks. The sun peeked out of the clouds and lit up the sky as we marched from colony to colony. 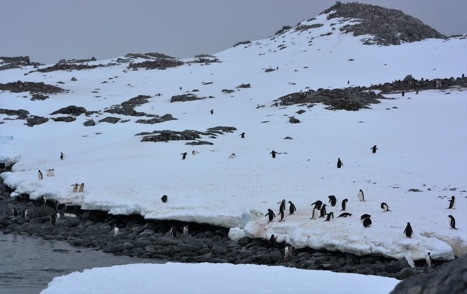 We also had some excitement as we were counting Adelie penguin colonies when we heard some faint peeping noises. 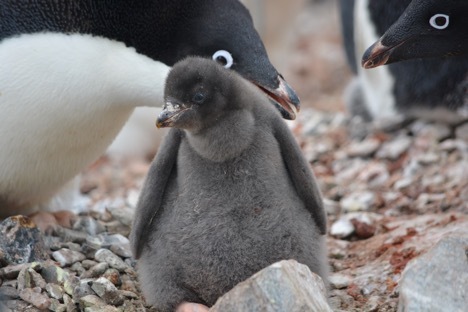 The next generation of these amazing black and white birds had just started to hatch. A couple of lucky parents had very young chicks so small the gray downy bird could fit on your hand. 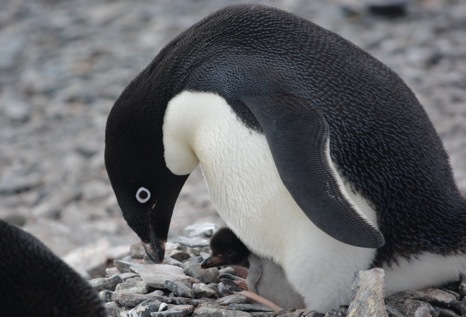 We could see that many more birds were about to hatch as well – multiple eggs had externally pipped, which means that the chick has cracked or put a hole through the eggshell. Very soon the colonies will become incredibly noisy and messy! In the coming weeks, we will see the parent’s inexhaustible efforts as they travel back and forth from the ocean to the nest to feed and raise their young. 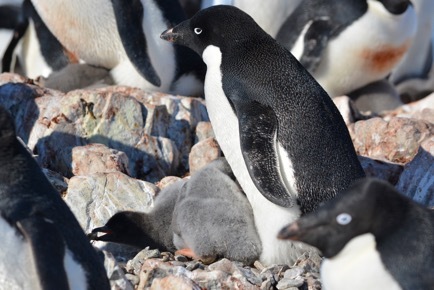 As is the case with many bird species, the chicks of Antarctica have to grow extremely quickly. Because the summer season (providing warmth and abundant food) is short, the young birds must grow quickly and prepare for migration or become ready to brave the harsh winter. 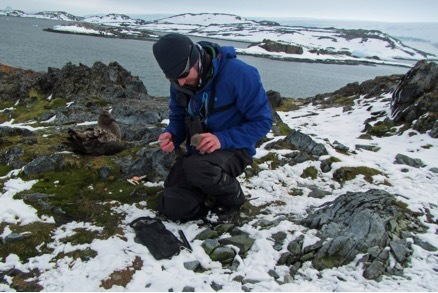 Brown skuas are also starting to hatch and soon the giant petrels will as well. 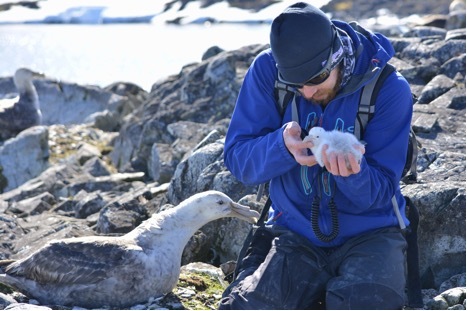 We have been doing a lot of monitoring of the giant petrels and have identified almost all of the breeding pairs in our study area that have eggs. 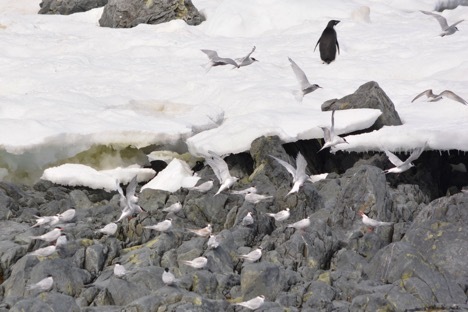 The giant petrels take turns incubating, with one bird at the nest, while the other bird goes foraging. Once we get the first parent’s band number, we wait about a week to let the birds switch roles. Then we can get the other parent’s band number while it is incubating the egg. All of these hatching chicks should keep us very busy in the upcoming weeks. Throughout our travels, we have been keeping our eyes open and are listening for blow spouts as humpback whales are usually in the area this time of year. Over the past weeks, we have had a few sightings of minke whales and we had a pod of orcas come by right in front of Palmer Station. 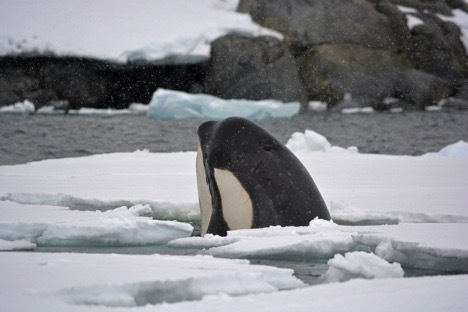 The orcas were popping their heads up out of the water looking for seals on the ice floes. This behavior is known as “spyhopping”. It was incredible watching these iconic, powerful animals work the inlet by station. The Detroit Zoological Society (DZS) is excited to start the New Year off in the right direction, thanks to a generous donation of Renewable Energy Credits (RECs) from ITC Holdings Corp., which offsets our electricity use 100% with certified energy from U.S. wind. In partnership with ITC Holdings Corp., we have purchased RECs through Green-e, an independent certification and verification program for renewable energy. RECs allow businesses, organizations and homeowners to invest in renewable energy when direct installation is not yet possible. To learn more about RECs, check out this EPA video on how energy enters the grid and how renewable energy is certified for investment. Because the DZS is unable to install large-scale wind turbines on-site (we’re in the processes of evaluating solar applications throughout our grounds) this investment in RECs is an amazing opportunity to support renewables while offsetting our energy use. These certificates show energy developers and our regulators that we demand renewable energy, which should in turn incentivize additional supply to the grid. In addition to the purchase of RECs, the DZS continues to focus on our Greenprint goals to decrease our energy use, increase our energy efficiency and invest in on-site energy generation. 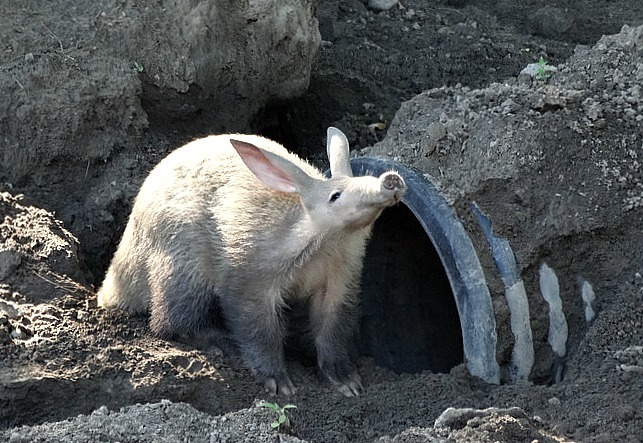 By early spring, the first zoo-based biodigester will be coming online, which will supply the DZS with biogas from compost that we will use as an energy source for the animal hospital. When switching your lights on at home, do you understand the source of your energy? Check in with your electricity provider to learn more. Most providers, include DTE and Consumers Energy, offer their customers green energy options similar to the program mentioned above. It’s not too late to include this in your New Year’s resolutions!